Yes, it’s another installment of our popular feature on the Australian language. In fact, the phrase ‘how to speak Australian’ is a common Google search that sends people to our blog (welcome strangers!). Most days, our lives proceed as normal… and then we encounter a word or two that stops us dead in our tracks. Sometimes we stare quizzically for long periods of time while our brains try to process meaning (people must think we’re loopy); other times, we just laugh out loud (then they must think we’re nuts). All in all, it’s a fascinating experience as we adjust to our new culture. It really does get rid of pong! Pong: Australia is a bit behind in terms of technology. While PS3 and Wii have taken over North America, pong is the big thing here… Just kidding. This does not refer to a variant form of ‘ping-pong’ (what must the Aussies think of that game?). Pong, it seems, is a term for a bad smell. 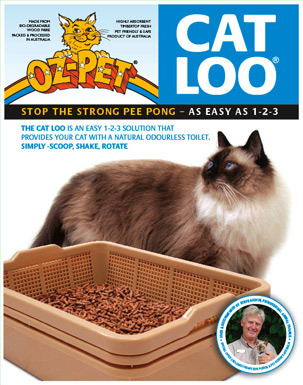 The Oz-Pet cat litter company makes a special litter box that lets the pee-soaked litter filter down to a lower tray so all that is left on top is clean pellets. The pissy stuff below is sealed in by the pile on top, and it doesn’t smell. And it really works…no pong noticeable. Wow! Why aren’t these available in Canada? I love the smell of pyrethroids in the morning. But spiders don't. Mortein: This is the most important word in Wagga. We thought it might be some odd hybrid of the French morte (death) and insect, but according to Wikipedia (and they are always right!) it means ‘dead one’ from the French dead (mort) and German one (ein). 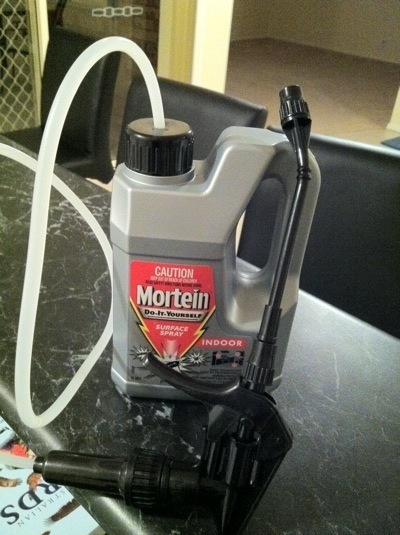 Mortein is a wonder spray that gets rid of spiders! You spray it around the outside of the house, around door frames, windows, etc., anywhere that a spider might live or be able to get into your house. Houses here aren’t well sealed, so there are gaps everywhere. Mortein creates a barrier between you and the spiders outside, and supposedly lasts for 6 months. And it coaxes them out of the crevices, and kills them. It’s evil! Wonderful, wonderful stuff. We happened upon it in Bunnings one day, and thought we would give it a try, though later one of Lisa’s colleagues mentioned it as something we should know about. Dan sprayed around the house, and by the next day there were about 25 to 30 spider corpses around the outside of the house. Most were harmless ones like wolf spiders, but he did get rid of one whitetail and one redback(!). Some died so quickly that they were hanging from a web string (we had to be careful not to walk into any of these). So we’re winning the game. Dan: 2; deadly spiders: 0. We recently bought a can of Mortein indoor, to spray around walls before our furniture arrives (and no, it’s not toxic for kitties). 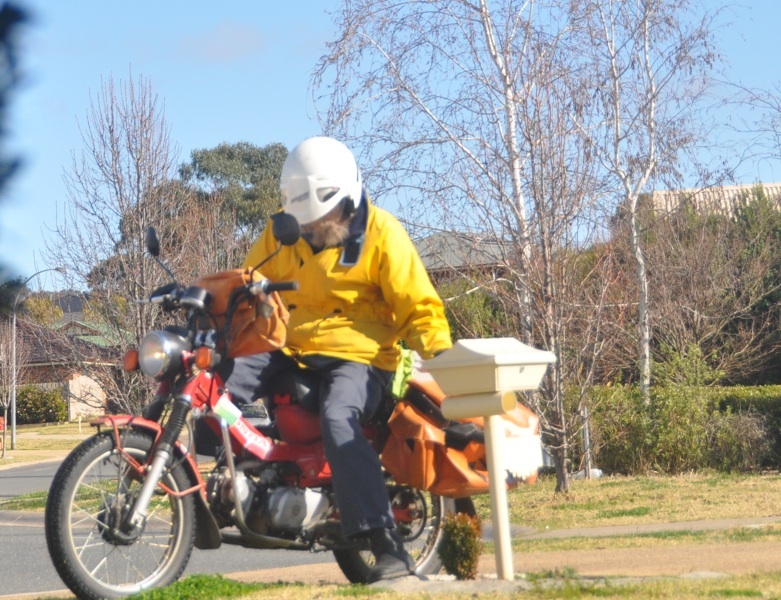 In trade for not being allowed to strike, Australian letter carriers get to ride motorcycles across peoples' lawns. Where do we sign up? Postie bike: We’ve seen these for sale in The Daily Advertiser (our local newspaper; you should read it to see what’s happening where we live! ), but it took a while for us to figure out exactly what they are. They are motorcycles that the mail carriers ride to deliver the mail. Yes, deliver the mail. To your house. No superboxes at the end of the block here, that you have to walk to; mail actually gets delivered. The letter carriers (postie bikies?) drive these little motorcycles all over the place, even up on your lawn to your mailbox. It looks like a really cool job. They probably even get paid for it, though it would seem like Australia Post could save a lot of money if they just explained how fun it is and let volunteers do the job. Not everything is delivered on bikes though, as bigger parcels are delivered in vans. This is is how we got the cats’ fountain delivered and a case of wine that Dan bought in an online auction. At around $10 per case for delivery, mail order/online wine sales may be keeping Australia Post in business. We wouldn’t trust Canada Post to deliver wine in Canada without breaking it, or losing it (or drinking it? haha). Here, it is a specialty service. This case of wine was purchased on a Saturday night, delivered to our door at noon on Wednesday, and sampled that evening. Canada Post couldn't move a box that fast, and they would probably break a bottle or two. Cracka and Vinomofo: OK, not common Australian terms, but ones that we have been using a bit. 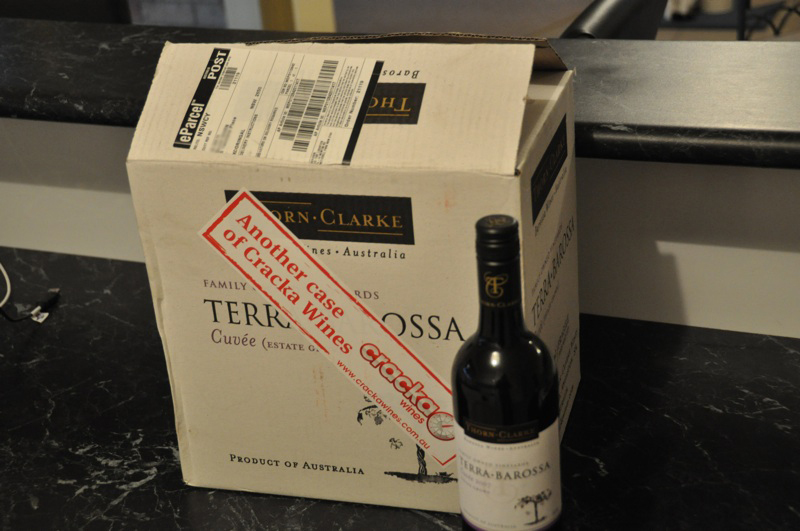 Cracka is an online auction site for wine, kind of like eBay. How it works is that they list some wines by the case (say 10 cases of WineX) on any given day; for the next 7 days, people bid on them, and on the 7th day there is a strange live auction/buy it now event where the price starts to drop until either people buy it at the ‘buy it now’ price, or it reaches the high bids. Dan bought a case of Thorn-Clarke cab/shiraz blend that retails for $20 per bottle for just $7.50 per bottle. Vinomofo is a Groupon-like wine site, where every day they put up a special at 40-60% off. They have a minimum number of cases that they have to sell, and also a maximum in stock. We’ve registered, but haven’t bought anything yet. We just love the less-Draconian liquor laws here. Can’t see this happening in Canada. I am not a mongy. There is no such thing on my planet. If you call me this, I will kill you with my death-ray eyes. Mongy: One day when we were still staying at The Lawson, Dan was talking with PerkyGirl about cats. She asked him what kind they were, and he said something like “just normal cats,” as in not Siamese, Sphinx, etc. She replied, “Oh, mongies.” This, it seems, is Aus for mongrel. Our cats would have been offended by Dan’s comment that they are normal, but even more offended by PerkyGirl calling them ‘mongies’. We have since decided that any time someone asks, we will explain that they are rare Canadian purebreds (not sure of the name yet…and don’t want to contravene anything that we said on the import papers; suggestions anyone?). It is also very likely that mongy is used for people too, something like feral. This entry was posted in bogans, bug spray, cat litter, cats, cooking, ferals, food, pet supplies, rissoles, spiders, Uncategorized, wine. Bookmark the permalink. It seems to be from Maggie, the affectionate short form of Margaret. In the eighteenth century, this was applied as a name for a cow or calf. In the nineteenth century it could refer to an untidily dressed woman or slattern. 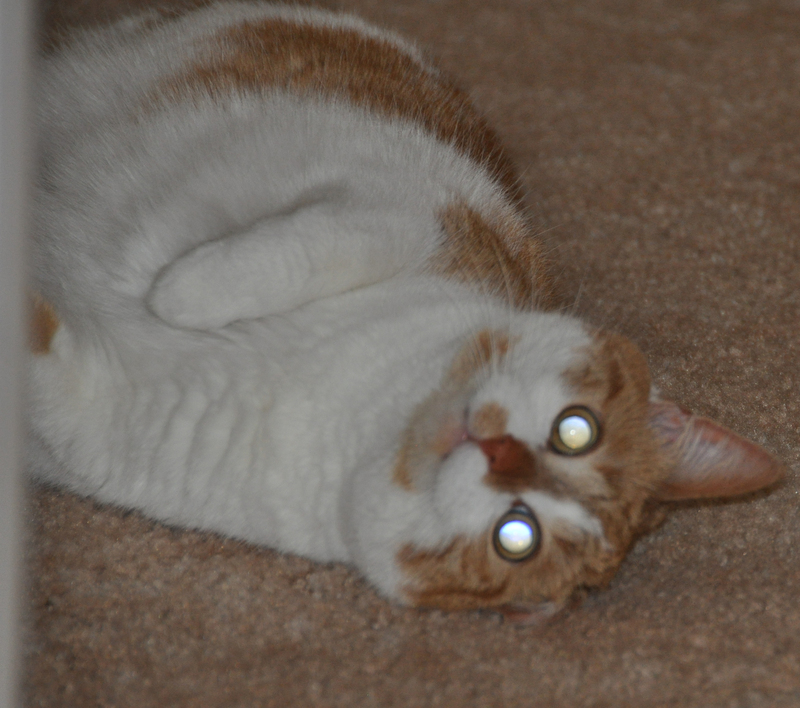 It was only in the twentieth century that it became a pet name for a cat. How or why the sense shifted in this way is not understood.